They say the best part of a journey is not the destination but the process. As the semester ends and we gear up for examinations, I want to thank you. 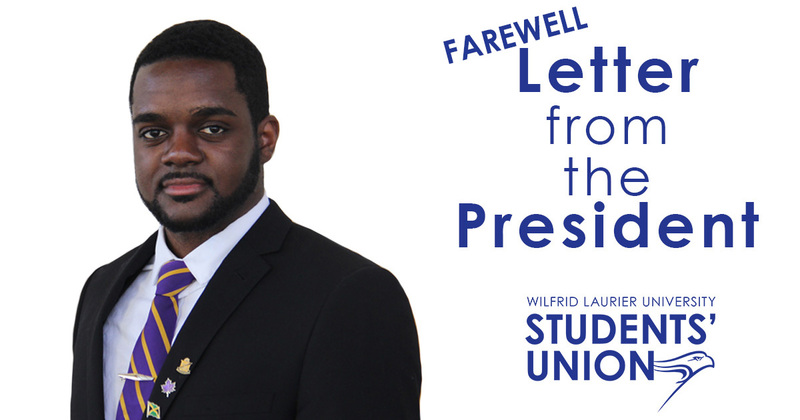 Thank you for electing me as your 2018-19 Students’ Union President. Thank you for allowing my VP team of Shannon Kelly, Darshil Shah, Nikki Corless, Sara Clark and Natalie Rigato to serve you. Thank you for helping us complete 11/15 platform commitments. Thank you for volunteering in our numerous committees and engaging with our 200+ clubs. Thank you for supporting our establishments (Wilf’s, Turret, Golden Grounds and Williams). Thank you for creating a Laurier culture on our campuses that we can all be proud of! The Students’ Union is incredibly happy to have helped shaped the experiences of so many undergrad students and will continue to for the semesters to come despite foreseeable challenges. As my time as president ends, I can truly say it was a defining period in the life of my team and myself. I want to wish incoming President Zemar Hakim and his executives all the blessings as the best is yet to come. Rock your exams folks and have a great summer!